The launch of BBM for Android and iPhone seems imminent, as BlackBerry briefly flipped the switch on the app's landing page today. 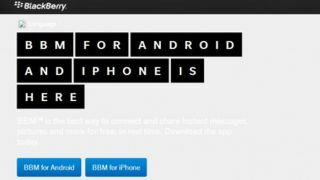 "BBM for Android and iPhone is here," declared the premature landing page, which was first spotted by the dedicated BlackBerry blog CrackBerry. Not quite "here," on second thought. The company has since pulled the trigger-happy web page, reverting it back to the old "BBM is coming to Android and iPhone" template. This temporary page shouldn't last long. BlackBerry has promised to deliver its cross-platform messenger "this summer," which means either after Labor Day in North America this weekend or at the very least, after Autumnal Equinox on Sept. 22. Right now, it seems as if the only people able to experience BBM outside of BB10 owners are a select few BBM Android beta testers who are friends and family of employees. Android owners aren't the only ones who get to be guinea pigs, as the new BlackBerry Beta Zone app lets BB10 owners test out apps before they're available for download by the public. "Load your BlackBerry 10 Beta applications through our brand new native app," wrote the company in the description for the new BlackBerry Beta Zone app. It looks like the launch of BB Beta Zone is meant to be, as the free download is still available via BlackBerry World for registered members of the BlackBerry Beta Zone. New BB Beta Zone users can enroll in the program for a new account, testing out early app updates for Twitter, Facebook and the aforementioned BBM.